﻿ AVI to QuickTime - How to Play AVI in QuickTime on Mac Mavericks? Home » video » How to Convert AVI to QuickTime to Play AVI in QuickTime on Mac Mavericks? AVI to QuickTime Converter - Solution to "QuickTime Cannot Play AVI"
The following article will explain why QuickTime cannot play AVI files as well as introduce a step by step guide on how to convert AVI to QuickTime MOV for playing AVI in QuickTime on Mac successfully. Why QuickTime Cannot Play AVI Files? The .AVI format is what is known as a container format. It can contain audio/video compressed using varying different codecs. If both the audio and the video were compressed using a codec that QuickTime can use, the AVI file will play normally in QuickTime. If the audio or video or both were created using codecs that QuickTime cannot use, you will fail to play AVI in QuickTime and see a message like the following: "QuickTime is missing the software needed to perform this operation. Unfortunately, it is not available on the QuickTime server" or "You may experience problems playing a video track in "filename.avi" because the required compressor could not be found." How to Play AVI in QuickTime on Mac? The most comprehensive solution for playing all kinds of AVI files in QuickTime is to convert AVI to QuickTime supported MOV format. 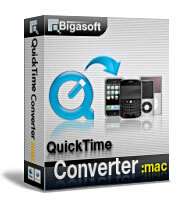 Bigasoft QuickTime Converter is just the ideal AVI to QuickTime Converter for Mac. It can easily convert AVI to QuickTime supported MOV format for playing AVI in QuickTime on Mac with ease. Besides, it also supports converting other video formats including WMV, WTV,MPEG, RMVB, AVCHD, ASF, MOD, TOD, FLV, MKV, DIVX, VP8 and more to QuickTime MOV for playing on QuickTime. Moreover, this powerful AVI to QuickTime Converter can also act as an AVI to Mac and Apple Converter. It can easily convert AVI to DV for import to iMovie or Final Cut Pro, convert AVI to MPEG-4 for import to iTunes/iPad/iPhone/iPod/Apple TV, and convert AVI to MOV for burn to iDVD or for Play AVI on Mac. How to Convert AVI to QuickTime Supported Format? 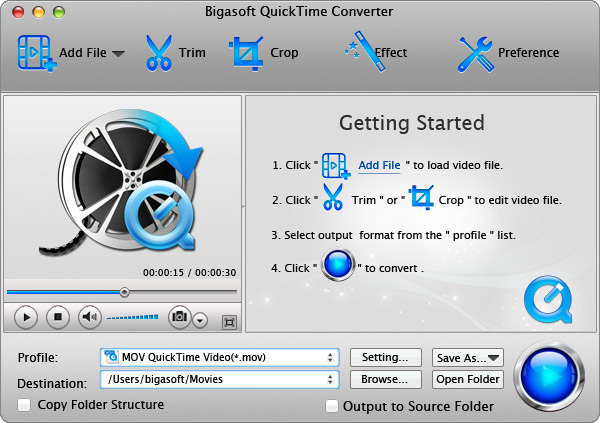 Step by step guide on how to convert AVI to QuickTime format with the help of Bigasoft QuickTime Converter for Mac. 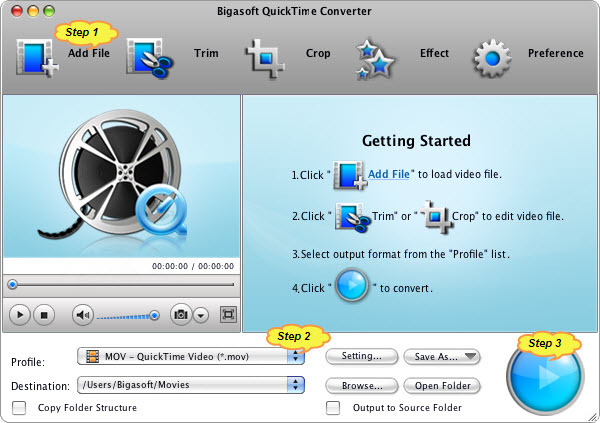 Free download the professional AVI to QuickTime Converter - Bigasoft QuickTime Converter for Mac, install and run it, the following interface will pop up. Click on the button of "Add File" to import AVI file to Bigasoft QuickTime Converter for Mac. Or just drag your AVI file directly to the main interface of this software. Click the drop-down button of the "Profile" to select MOV- QuickTime (*.mov) as output video format from the "General Video category. 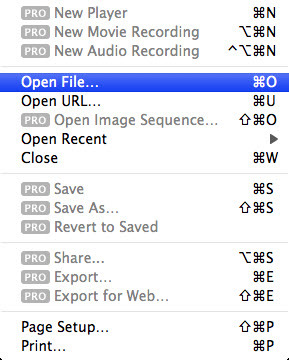 Click "Convert" button to start and finish converting AVI to QuickTime compatible video format. Run QuickTime, and then click "File -> Open File..." to import the converted AVI to QuickTime for play AVI on Mac. With the above guide, it is just easy to play AVI in QuickTime on Mac OS X Lion, Snow Leopard, Leopard, Tiger.